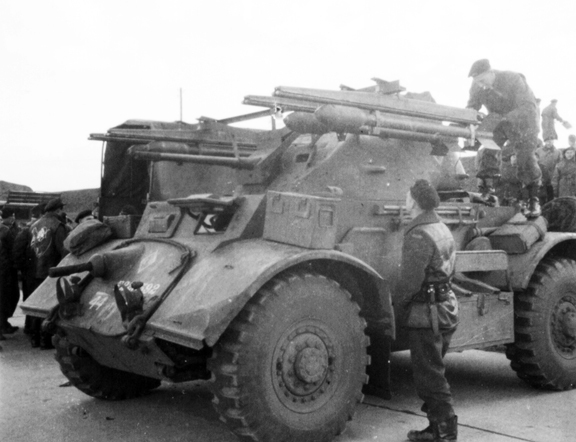 In North-West Europe in November 1944, the 18th Armoured Car Regiment (12th Manitoba Dragoons) was seeking a means to deliver more high-explosive firepower, than could be provided by their Staghound armoured cars’ 37mm guns. The Dragoons were often too far out ahead to call in artillery support, but needed an “on-call” HE capability to soften up resistance. 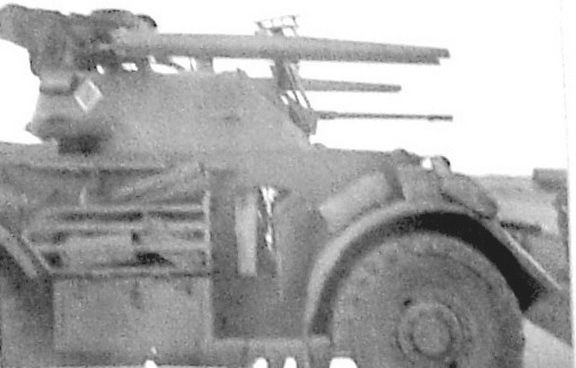 This was supposed to be supplied by the Staghound III, with a 75mm gun, but it had yet to enter production, Efforts to obtain some M7 Priest 105mm self-propelled guns were also unsuccessful. With the permission of HQ First Canadian Army, the Manitoba Dragoons borrowed four obsolete Rocket Launcher Rails Mk.I and a number of 60 lb. warhead aircraft rockets, used with the Hawker Typhoon from the RCAF. The modifications were a carried out on 19 November, 1944, by 40 LAD. 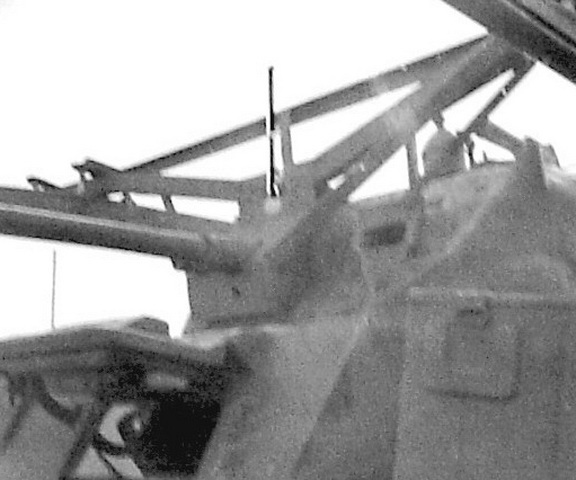 The rails were attached to the mantlet so the rockets could be elevated with the gun (no doubt with some difficulty, given the rig’s extra 200 or so extra kilos). Rotating the turret provided the traverse. 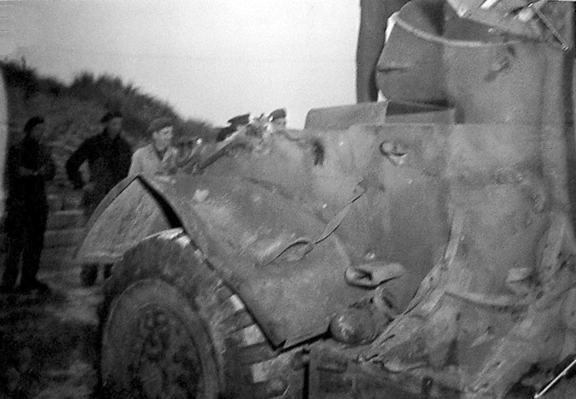 The edges of the rails protruded about 3 inches (7.5 cm) beyond the sides of the armoured car. The system was tested on 20 November and more formal trials were held at St. Phillip’s Island – under the supervision of First Canadian Army AFV staff – on 26 November and 2 December. Results were generally promising, although – due to limitations of the ground – the ranges achieved could not be accurately measured. It was estimated that rockets went anywhere from 100 to 3,000 yards (90 to 2,750 metres). Accuracy (particularly in terms of range) was wanting, and at short ranges the rocket warheads often failed to detonate. 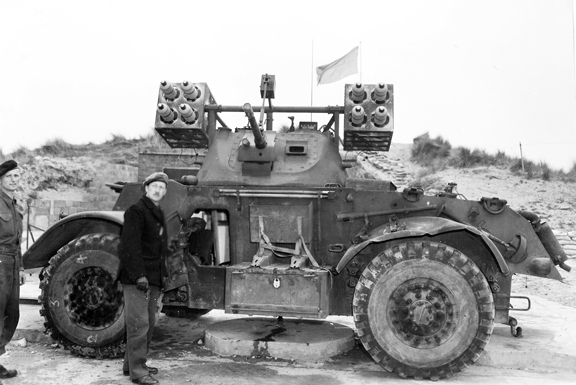 Neither the car nor its crew suffered as a result of the rockets’ back-blast and the trials were considered sufficiently successful for First Canadian Army to recommend to CMHQ that further development be undertaken. In the meantime 12th Manitoba Dragoons continued to work their original design. In February 1945, 40 LAD was preparing to fit rocket rails to other Staghounds to support patrols across the Waal river, but this was cancelled when the regiment was ordered into a mobile offensive role. 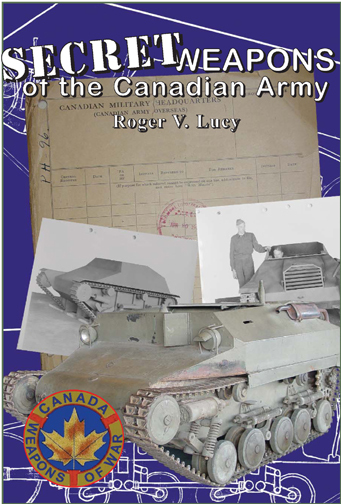 Photographs of 4 CAB’s half-track mounted rocket launcher from First Canadian Army’s Weapons Technical Staff Officer Major A.G. Sangster.s report. The British Coldstream Guards also undertook similar experiments in early 1945 fitting Typhoon rocket launcher rails to the sides of a Sherman Firefly. Christened the Tulip, it reportedly had the good luck to hit, and kill, a Tiger. While this ended field expedient rocket launchers Canadian Military Headquarters (CMHQ) in London took up the proposal, and in January 1945 conducted their own tests, using a similar arrangement. While the results were promising, the performance of the Mk.I rails was deemed unsatisfactory. British experts pointed out that air-launched rockets were unsuitable for ground use, and recommended that further development focus on SEAC spiral launchers, using 3-inch (76mm) and 5-inch (125mm) rockets – types already allocated to First Canadian Army for the Land Mattress. 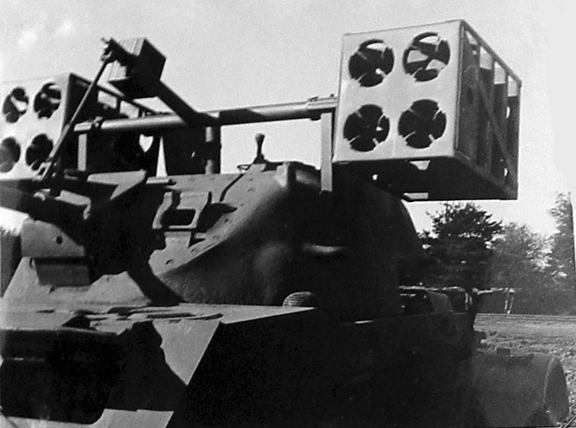 The War Office saw no requirement for rocket-armed armoured cars, but was interested in developing cast aluminum spiral launchers that could be mounted on any armoured vehicle. Staff at CMHQ, took the idea further, drawing up a concept for a dedicated vehicle, with the turret replaced by the launcher tubes and an observation cupola for the operator. 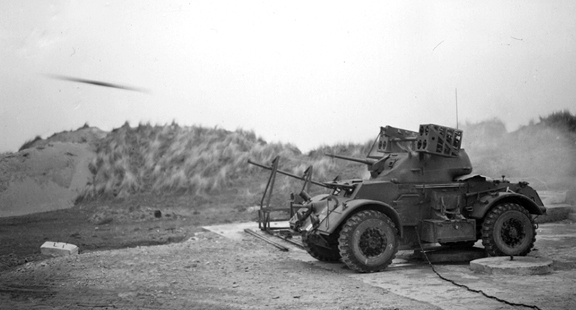 Work was therefore continued, as a long-term development, still using the Staghound as the platform. With help from British rocket experts at CEAD, a launcher using six cast aluminum spiral launching rails was developed. CMHQ ordered 12 pilot cast-aluminum spiral launcher tubes from a Birmingham foundry – the Northern Aluminium Co. The results were unsatisfactory, only five tubes were delivered before the rest of the order was cancelled in July. In order to proceed with the trials, No.1 Canadian Base Workshops (1 CBW) fabricated a set of eight steel tubes. 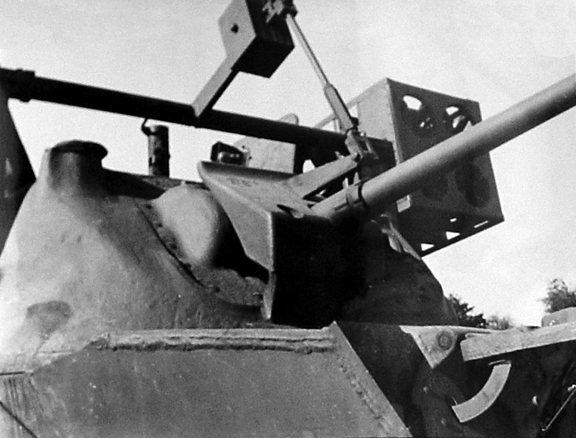 After looking at two possible mounting options 1 CBW mounted four on each side, in banks of two, attached to the turret by angle irons and steel tubing. The rails were linked (with a counter-weight) to the gun barrel, and elevated with it. A range dial (in the form of a quadrant, attached to the gun’s trunnions) allowed more refined aiming. 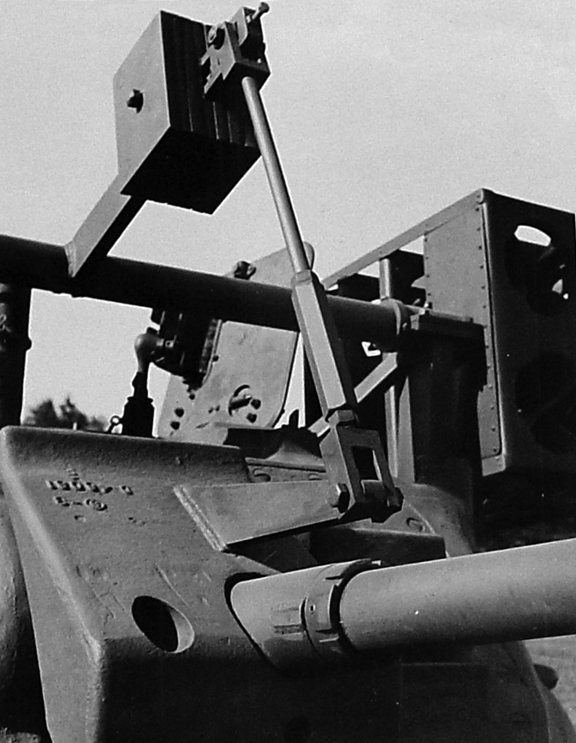 This photograph from the report on the trials of the Staghound Rocket launcher at Ynys-Las South Wales, in April 1945 shows details of the mechanical linkages of the Rocket Projector mounting. 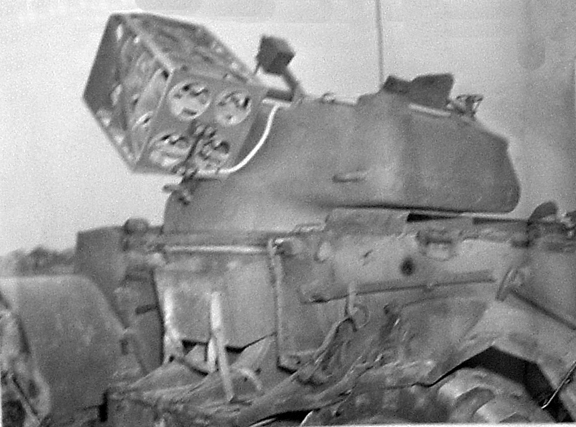 This photograph provides a front view of the rocket projector and mounting. Here are further details of the mechanical linkages of the Rocket Projector mounting. This photograph shows damage to the fender caused by the back blast of a rocket salvo. Another view of the blast damage. The junction boxes for the electrical firing gear can be seen on the rear of the projector. The revised system was ready on 5 April and tested on 26 April at Ynys-Las South Wales. Some 35 rockets were fired in all, with generally satisfactory results. While little harm was done to the crew, the back-blast of a full salvo damaged the rear mud-guards and activated the CO2 fire-extinguishers. In addition, ripple firing caused serious erosion to the launcher rails, eventually damaging one so much that the fin of one of the rockets was pulled off, causing it to break up in flight. The addition of blast deflectors to protect the CO2 release handles was recommended. 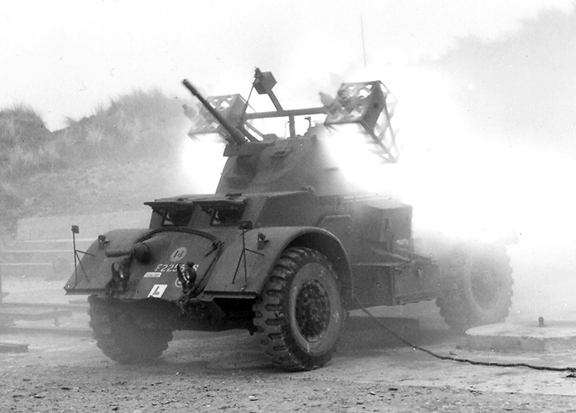 This series of photographs taken at Ynys-Las on 26 April 1945, shows the Staghound rocket launcher undertaking a shoot. The vehicle belongs to 1 CACRU. Note the damage to the fender from the blast. This photograph shows the intensity of the back-blast. 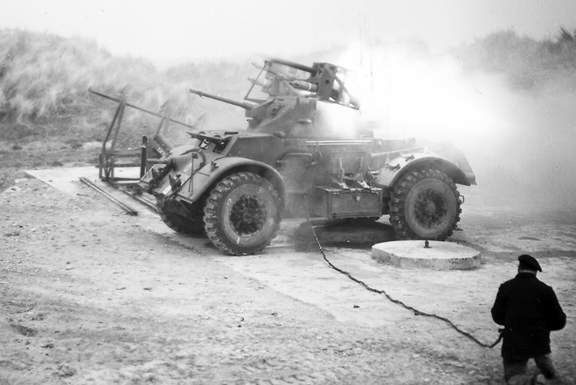 The Staghound fires a single inert round. Reloaded, note the damage the back-blast has caused to the rear mudguard. A new contract for cast aluminum tubes was awarded to High Duty Alloys Ltd. of Slough which was able to deliver. Getting range access delayed testing the redesigned launcher. It finally took place the British Chemical Warfare Establishment at Porton Down, in December 1945. The results were very successful; damage to the fins was avoided by champfering their edges. However – and not surprisingly, given Porton Down’s purpose – British interest in the system now concentrated on its potential for delivering chemical and smoke rounds. Work did continue of the project – to develop a suitable smoke round – at least into March 1946. Eventually the Staghound Rocket Launcher was returned to Canada.